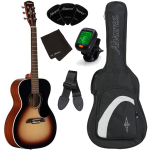 Featuring a spruce top for great sound, the easy-playing RF26S acoustic guitar includes everything you need to get started for under two hundred bucks. Alvarez believes a great starter guitar should be easy to play, so they gave the RF26 a slim, comfortable neck profile with a narrower, 1” 11/16 (43mm) nut width. This width provides enough spacing for fingerpicking, but is slim enough to help make chords easier to fret. Alvarez also hand-scallops the top bracing, making this one of the loudest, best-sounding smaller-bodied acoustics out there. Also included is a deluxe 15mm Alvarez logo gig bag, along with a clip-on digital tuner, guitar strap, polishing cloth, and additional picks.